Whether your company is a huge B2B technology SaaS vendor or a small B2C retail company – or anywhere in between – maximizing the relevance of your website is critical to your success. Upwards of 97% of your web audience is anonymous. 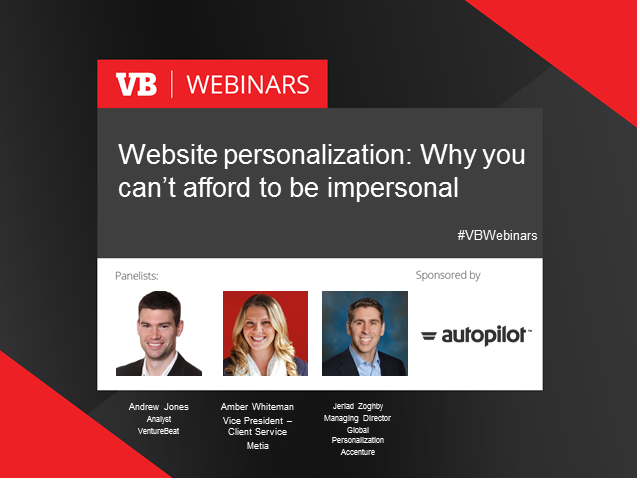 Can you afford to wait to begin personalizing until they share an email address? Web personalization affects bounce-rates, time-on-site, page views, conversions, and other critical success metrics. In fact, we found that 87% have seen a lift of at least 5% in their most important metrics, excluding those who say it’s too early to tell. Two in five (39%) have seen increases of at least 20% in their most important metrics. But your company is unique. What are your priorities? How do you address them? Which vendors are relevant – to your business type, company size, audience, and budget? * Discover the best way to personalize website content -- it's not what you'd think. This webinar will be based on Andrew Jones' VB Insight report, which will be published in September, 2015.